Squamous cell carcinoma of the head and neck (SCCHN) is the 6th most frequent cancer, accounting for approximately 600,000 new cases annually worldwide. According to the National Cancer Institute, several risk factors, particularly first-hand smoking and heavy drinking, contribute to the risk of developing head and neck malignancies. SCCHN is frequently diagnosed at an advanced stage due to the lack of early signs and symptoms. The FaDu cell line was derived from a hypopharyngeal tumor of a 56-year old Caucasian male patient. FaDu produces proinflammatory cytokines and activates neutrophils in vitro. Epidermal growth factor receptor (EGFR) is usually overexpressed in SCCHN and is an essential driver of disease progression. EGFR targeted therapies have proven to be advantageous for the treatment of SCCHN. A 2014 study by Williams et al. published in PLoS One investigated the efficacy of Dacomitinib (PF-00299804) alone and in combination with ionizing radiation (IR), in FaDu cells in vitro and in vivo using the FaDu xenograft model. These findings report that Dacomitinib treatment leads to a significant reduction in EGFR signaling and decreases phosphorylation of downstream targets such as ERK, AKT, and mTOR and delays tumor growth. The study indicates that the combination treatment of Dacomitinib and IR is beneficial for the management of patients with SCCHN. A 2009 Molecular Cancer Therapy study (Ekshyyan et al.) used the FaDu xenograft model in their investigation of CCI-779, the mTOR inhibitor, in its effects on radiosensitivity. Results demonstrated CCI-779 enhanced the growth inhibition of radiotherapy (XRT), as evidenced by activation of Akt/mTOR, with higher survival rates than when tumors were treated with cisplatin and XRT. Effects on tumors included activated apoptosis as well as antiangiogenic activity. Overall this promotes the use of CCI-779, rather than cisplatin, to enhance radiosensitivity in SCCHN patients. McCall et al. (2012) used the FaDu model in the study to analyze how Copper-diacetyl-bis(N4-methylthiosemicarbazone) (64Cu-ATSM), a highly lipophilic radiotracer for PET imaging, behaves in hypoxic tumors. Kinetic analysis results indicated that 64Cu-ATSM uptake is specific to malignant cells and that microscopic cellular distribution did not correlate with Pimonidazole, a hypoxia marker. This suggests that 64Cu-ATSM has potential for malignant cell imaging but is not an indicator of hypoxia. Lastly, Simons et al. (2008) used FaDu xenografts to determine the effect of combination treatment with cisplatin and 2-deoxyglucose (2DG), an agent that induces oxidative stress. Data showed an increase in cytotoxicity with combination treatment, inhibition of tumor growth and enhanced disease free survival with combination treatment; using 2-[F-18]-fluoro-2-deoxy-D-glucose (FDG) PET imaging they also demonstrated that FDG uptake correlates to tumor sensitivity. These results support the use of this combination 2DG and cisplatin treatment in a clinical setting alongside radiation. The FaDu cell line (human hypopharyngeal) is used to create the CDX (Cell Line Derived Xenograft) FaDu xenograft mouse model. 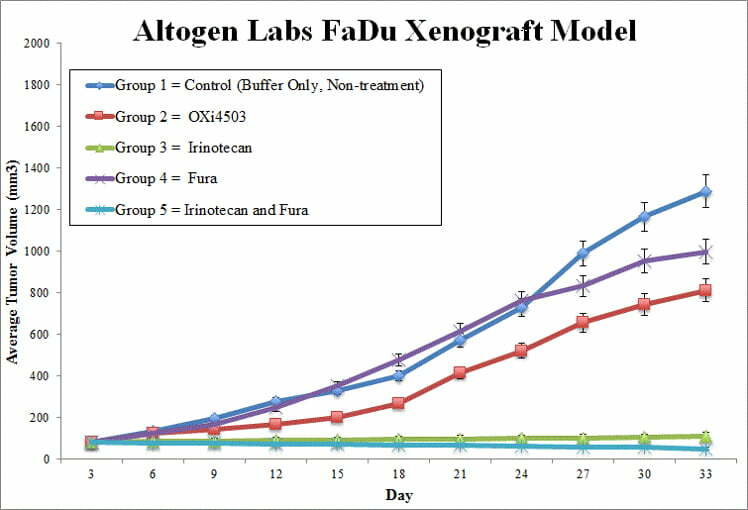 The FaDu xenograft model is an efficient head and neck cancer (HNSCC) tool for studying response to therapeutic agents alone or in combination (irinotecan, fura, oxi4503). The FaDu cells used for injection are grown at a phase of exponential growth. At study initiation, FaDu cells are collected. Cell viability is determined utilizing a trypan blue exclusion test (minimum of 98% cell viability). One million cells, in a volume of 100 µL (Matrigel-FADU cell suspension) is injected into the hind flank of each mouse (athymic BALB/C (Nu/Nu), 8 w.o.). The injection sites are palpated up to three times a week. Upon establishment, digital calipers are used to measure the tumors until and average size of 50-150 mm3is established. Randomization into treatment cohorts and subsequent administration of the test material is performed following the study treatment schedule. Measurement of tumors take place daily and mouse weights are recorded up to 3 times weekly. Euthanization takes place as tumor size reaches the study size limit or 2,000 cu millimeters. A necropsy is performed as defined for the termination of study. All tumors are excised from the mice, weighed and then further documented via digital imaging. Standard necropsies are performed and tissues are collected. Tumors and tissues can be snap frozen, stabilized in RNAlater, prepared for histology or nucleic acid isolated for gene expression analysis.